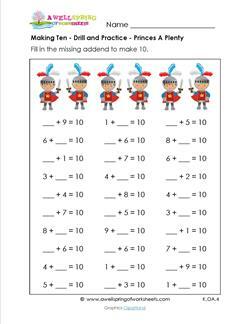 This making 10 worksheet is for kids just beginning to add up to ten. Twelve problems, starting with 1 + __ = 10 and going to 9 + __ = 10. A knight in shining armor to the rescue! He'll help your kids make ten by figuring out the first addend in these 12 problems. Introducing a sweet princess who is here to cheer kids on to make ten. Fill in the first or second addend in these twelve problems. 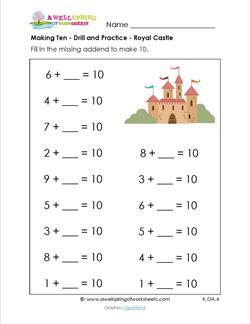 Come to the royal castle and get a tour of these making 10 addition problems. Stroll through these 15 problems and fill in the 2nd addend. Grab the armor and fight the good fight! 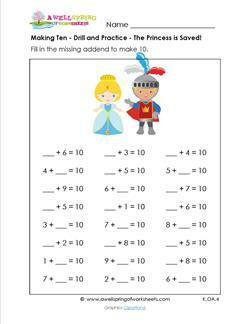 Do your very best to fill in the 15 blanks in the first addends in this making ten worksheet. Suited up and sword ready! This cute soldier is ready for battle. 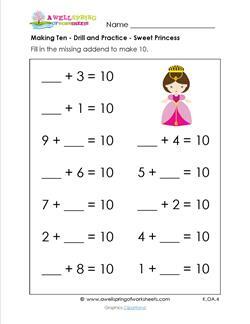 Make sure your kids are ready to practice their addition facts to make 10 in these 15 problems. What! Are these boys crazy? 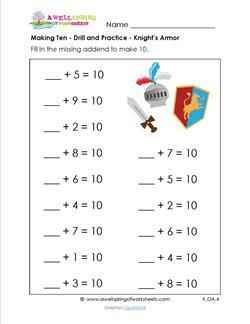 Why duel it out when they can help kids practice make ten with these 24 problems? Why slay the dragon when you can train him to be your pet? Better yet, train yourself to know all your making ten facts by heart! You can start with this page of 24 problems. The prince has won the princess's heart and her hand! 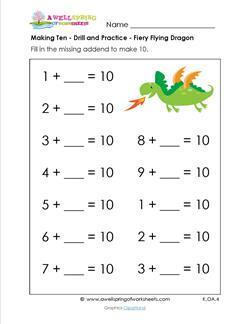 But you can put your whole heart and a pencil in hand to add and make 10. 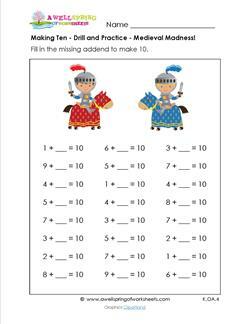 There are 24 problems on this worksheet. Together at their castle ... the stuff fairy tales are made of. 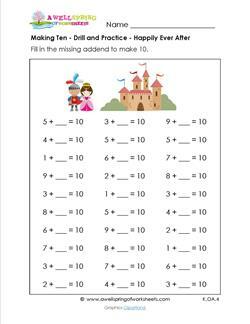 Until your true love arrives you can practice your addition by filling in the addends that are missing! Girls might say "OOH!" to these princesses. Boys may say,"ICK!" But they can both fill in the missing addends in these 30 problems to make 10. 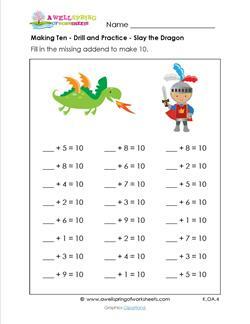 This advanced addition worksheet has cute (but serious!) princes standing guard to see that you make ten the right way! 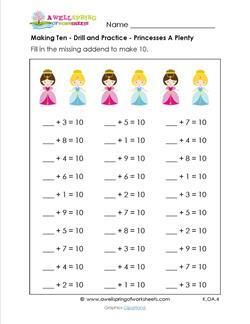 KIds fill in the missing addends in these 30 problems.